The robotic job market has been a hot topic lately, as more and more people believe that the majority of jobs will be overtaken by automation. A recent study conducted by Oxford researchers argues this is partially true. 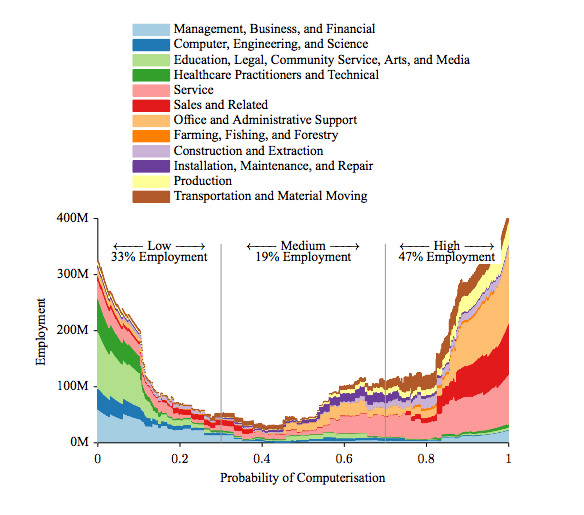 Upon analyzing 700 different jobs to assess which ones are most likely to be automated, about 47% of them were found to be susceptible. There is, however, a major distinction between gender in the labor force. For example, in a United States survey of 3 million people in each field, 95% of truck drivers are men, whereas 95% of secretaries are women. Occupations which require physical labor, such as construction and tree trimming are most likely to see drastic changes. Out of the 2.5 million carpentry and industry jobs in the United States, 97% of the workers are men, and the industry has a 70% chance of being automated. Nurses, on the other hand, are 93% women and have a .009% chance of being replaced by robots. Construction and labor positions can be replaced by the current technology in robotics. Even stock trading, a predominantly male occupation, has been largely replaced by algorithmic computing. Female-dominated positions usually require more emotional and intuitive insight, something robotics has not caught up with yet. The results of this shift could indicate a largely female workforce in the future. However, this could spell trouble if many families end up with only one income to support themselves. The year 2013 saw the highest number of robots sold to industry companies. Sales increased from the previous year by 12%, to 178,132 units. These were primarily for the automobile industry. Baxter, a robot designed by MIT for plastic and metal manufacturing, costs $22,000 and can perform the jobs of two people at once. By 2024, it is estimated that 30% of households may have a robotic assistant.